I had a pair of ballerinas that I didn't use anymore (they were a bit boring) so I decide to give them a new look. I am in love with captoe ballerinas and i thought it will be something easy to do... so here we go, hope you find it useful. 1. 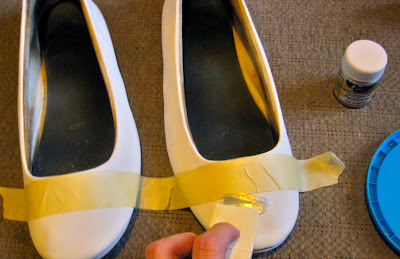 First, make sure the whole shoe is cover with the base color. 2. Decide the size of the "captoe" and cover with tape. 3. Use the sponge to cover with the silver paint. You can use a brush too but the sponge its better to avoid brush painting lines. You may have to give two or tree coats to get the full color. 4. 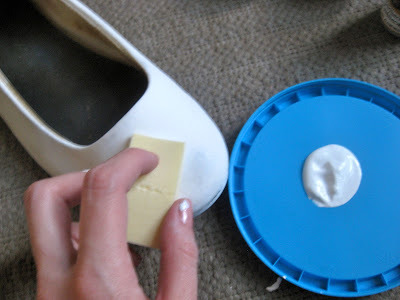 When the shoe is dry, use some shoe polish to cover all your shoe (read the shoe polish instructions).